Do you often lash out at people? Do you let your emotions rule your interactions with others? Do you find it difficult to see things from others’ point of view? You are not alone. Despite the fact that we all have to deal with other people our daily lives, many of us have difficulties with interpersonal relationships. 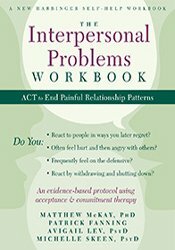 Written by psychologist and bestselling author Matthew McKay, The Interpersonal Problems Workbook combines research and evidence-based techniques for strengthening relationships in all areas in life-whether it’s at home, at work, with a significant other, a parent, or a child. The skills in this workbook are based in both schema therapy and acceptance and commitment therapy (ACT), and are designed to help you connect and communicate effectively with those around them. Matthew McKay, PhD, is a professor at the Wright Institute in Berkley, CA. McKay received his PhD in clinical psychology from the California School of Professional Psychology. In private practice, he specializes in the cognitive behavioral treatment of anxiety and depression. Avigail Lev, PsyD, maintains a private practice in Berkeley, CA. She specializes in couples' therapy and also treats individuals who struggle with interpersonal problems, anxiety, trauma, chronic pain, and mood disorders. She has provided supervision, trainings, and workshops utilizing cognitive behavioral therapy (CBT) and is the coauthor of Acceptance and Commitment Therapy for Interpersonal Problems. Michelle Skeen, PsyD, is a therapist who lives and works in San Francisco, CA. She has provided brief and long-term therapy for individuals and couples by utilizing schema and mindfulness-based approaches to address interpersonal issues, weight management, anger, depression, anxiety, disabilities, and trauma. She is author of Love Me, Don’t Leave Me, and coauthor of Acceptance and Commitment Therapy for Interpersonal Problems. Skeen hosts a weekly radio show called Relationships 2.0 with Dr. Michelle Skeen on KCAA 1050 AM. To find out more, visit her website at www.michelleskeen.com.